EXCLUSIVE Bake perfect cookies, cake rolls and more with this pan that features a superior nonstick dual coating for easy release every time. Created by USA Pan exclusively for Sur La Table, our line of Classic bakeware is ideal for both novices and experienced bakers alike. 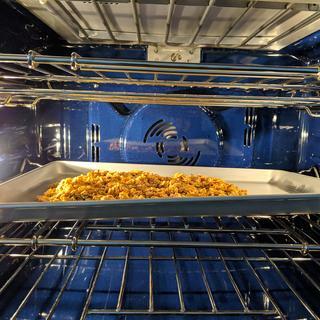 Thanks to commercial-grade aluminized steel of a lighter color that provides even baking and a rolled rim for excellent durability, this pan delivers perfect results over a lifetime of use. Available in half sheet and quarter sheet sizes. Perfect for everyday cooking/baking tasks that don’t require a full-sized cookie sheet. Unlike some other baking sheets, this one is very sturdy, and the nonstick surface is fantastic—best I’ve ever found. Nice size up from a toaster oven tray. Excellent quality. Wanted a pan that is dishwasher safe, like the description said, but rust just poured out of the edges coming out of the dishwasher. Actually returning it tomorrow :-(. Wish I could find this size in stainless steel! This is a handy little pan but it does the strangest thing. At room temperature the sheet pan is perfectly level when it sits on a flat surface. After coming out of the oven, while it is still hot, it is warped, and it wobbles on a flat surface. After cooling it returns to its normal shape. Love these little pans! Super sturdy! I bought these in two different sizes and they warp when put into the oven. It doesn't matter if it's a low temperature or a high temperature, I'll hear a pop and then the sheets warps into an uneven shape which is a problem when baking. I definitely wouldn't recommend them. I bought this as a solid pan for my toaster oven, one that could take constant use. This is it! Being a bit lazy, I keep it lined with foil for easy, easy clean-up. Reynold’s foil sheets are a perfect fit! Heavy duty construction. Slight warp when placed under broiler (temp was probably higher than ipan is rated for) but returned to perfectly flat when cooled. Excellent non-stick finish. Was looking forward to using this pan as I had purchase one years ago at this store and love it. This newer version warps almost immediately after putting in oven. I am going to return it and see if there is a higher grade sheet pan. This is smaller than I envisioned BUT it has proved to be a very versatile pan in the kitchen. Have used for roasting vegetables with great success; a good size for two people to four. I would think of it as less a cookie sheet and more of an oven option. Quality is very good; very sturdy. I expect to use frequently. One can never have too many sheet pans! I have and like the larger size pans and would also like the smaller size pans. Have one that was given to us as a gift. Enjoy using it and wanted another one. These quarter sheet pans have become a staple in my kitchen- use them every single day. I like to roast different vegetables that require different roasting times. Smaller pan = more room in the oven! I absolutely love these pans. What else can I say! perfect for roasting small amounts of veggies! Nonstick, and a versatile size. My old ones badly needed replacing. I am single so these are a perfect size to roast vegetables. We have a small oven and these fit perfectly! Bought one for ourselves a while back for our Breville Smart Oven. Worked so well, wanted to give one as a gift for someone with the same oven. Nicely weighted pan. My brother bought a Breville oven and needs more cooking pan options. Love sheet pan cooking and this looks perfect for my collection. Quality baking sheet. I bake a lot of cookies and I need a good durable baking sheet, this is more than suitable. Best little go to boiler pan. I give them to my friends too? I like the size and the shallow edges. We already have 2 of these pans and absolutely love them!! I probably use this pan the most for baking, roasting...everything up to gingerbread house making (perfect sized). I have this and use it daily. I want another one. Addition to larger size sheet pans. My friend has this baking pan and it is an awesome size for small projects. I needed this size sheet pan. What is the non-stick material? Is it non-toxic?